I recently received a PR package from Wet n Wild which contained the entire collection from their new Flights of Fancy collection. The makeup collection is based around hummingbirds, and the colours that they are. One other great thing is that all the products are animal cruelty free, an a few pieces are vegan friendly! The lip glosses, which retail for $3.99 USD each, are the first thing I tested out. I loved the four very different shades that were available, as well as the applicator and packaging. The formulation is really nice, and goes on smooth, the only downside is that there is no scent to the product, and I wish there was especially for a lipgloss. The eyeshadow quads are easily one of the most pigmented drugstore palettes I've seen, and they retail for $2.99 USD. The three different palettes are reflective of the colours of a hummingbirds feathers, and I love the combination of the colours paired. If you're wanting to try something from this collection, I would highly recommend these. 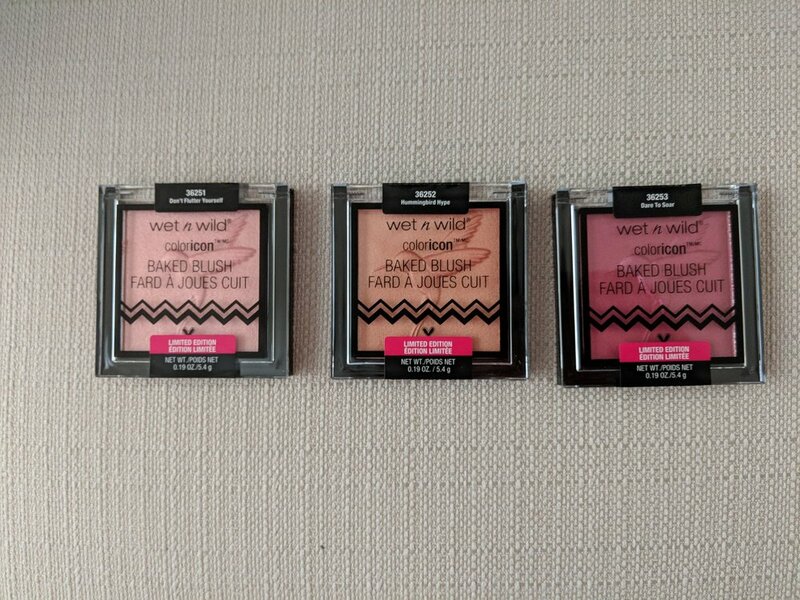 The Flights of Fancy collection also had three shimmery blushes (which can double as a subtle highlighter). I thought the choice of shades was great as one shade worked with either a light, medium, or dark skin tone. These blushes pack a punch in terms of glitter, but I found the colour payoff wasn't as strong, especially since I swatted these directly after the eyeshadow quads. The Two MegaLiner's sent retail at $2.99 USD each, and have a thin, easy to apply, brush. I like the three colours that the collection offers, but the formulation difference between even these two shades was very drastic. The green goes on smoothly, is very opaque, and dries very quickly. The metallic gold is thin, and patchy on the eyelids, and I would not recommend this one. The last two products in the PR kit were the priming spray($4.99 USD), and the perfect pout lip scrub($3.99 USD) in watermelon. I absolutely love this lip scrub. It is a little rough, but is completely made of sugar, and left my lips super soft. The priming water spray works great as a primer, but even better as a setting spray. I liked both of these products, and think they're great, especially for their price point. Overall, I was pleasantly suprised by this collection. Everything, apart from brushes, retail for $5.99 USD or less, making them extremely affordable, and great products for their price. This entire review and the opinions expressed are solely my own, this post was in no way sponsored.